Before you make your feast, a few leftovers recipes you may want to plan ahead for. 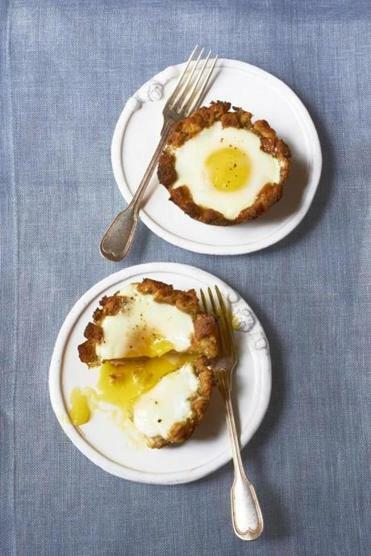 To make Baked Eggs in Stuffing Cups with chunky stuffing, simply chop it with a chef’s knife before starting the recipe. Likewise, if your stuffing is dry and not malleable, add a little broth. This idea comes from Annie Copps. I use a jumbo muffin tin (the cups are about 8 ounces), but a standard one will also work: Just use about ⅓ cup stuffing per cup, bake the stuffing for a few minutes less initially, and use medium eggs. With the rack in center position, heat oven to 425 degrees. Generously butter the cups of a nonstick jumbo muffin tin. Add about ⅔cup stuffing to each cup and use your fingers to press the stuffing to form cups. Bake until the stuffing is a shade darker and crisp around the edges, 15 to 20 minutes, rotating muffin tin halfway through baking. Remove the tin from the oven, break an egg into each cup, and sprinkle lightly with salt and pepper. Return to oven and bake until eggs are opaque around edges and the centers are still loose and wobbly when you jiggle the pan, about 7 minutes. Cover the tin loosely with foil and rest for about 5 minutes for very runny yolks and up to 10 minutes for firmer yolks. 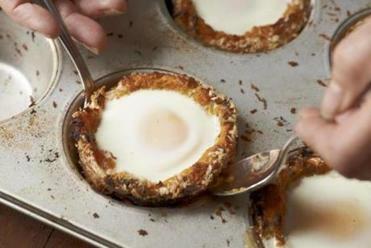 Use a soup spoon to loosen the cups, remove them from the muffin tin, and serve at once. TIP: The potato and squash cups are somewhat fragile, so use 2 spoons to lift them. If your potatoes are very moist, use optional flour. With the rack in center position, heat oven to 425 degrees. Generously butter the cups of nonstick jumbo muffin tin and set aside. In a medium nonstick skillet over medium-high heat, melt 1 tablespoon butter. When foaming subsides, add the onion and ½ teaspoon salt and saute, until soft, about 4 minutes. Add the garlic and thyme or sage and saute 1 minute. Add the flour, if using, and saute until light gold, about 1½ minutes. Set aside off heat to cool to room temperature, about 15 minutes. In a medium bowl, stir the potatoes, onion mixture, Parmesan, and 1 teaspoon each salt and pepper to incorporate. Spread panko in a shallow dish. Scoop up 1/6 of potato mixture and make a 4½-inch patty. Dredge 1 side in panko, pressing to adhere, and fit crumb side down into a cup in the tin; repeat to fill tin. Bake until the potato is golden brown around the edges, 15 to 20 minutes, rotating the tin halfway through baking (the potatoes will slump, which is OK). Remove the tin from the oven, use a dinner spoon to pat the potatoes back into shape, break an egg into each cup, and sprinkle lightly with salt and pepper. Return to the oven and bake until the eggs are opaque around the edges and the centers are still loose and wobbly when you jiggle the pan, about 7 minutes. Cover the tin loosely with foil and rest for about 5 minutes for very runny yolks and up to 10 minutes for firmer yolks. Gently loosen and remove cups and serve at once. With the rack in center position, heat oven to 425 degrees. Generously butter the cups of nonstick jumbo muffin tin and set aside. Use paper towels to blot squash chunks until very dry, then place them into a medium bowl; set aside. In a medium nonstick skillet over medium-high heat, melt 1 tablespoon butter. When foaming subsides, add onion and ½ teaspoon salt and saute, until soft, about 4 minutes. Add garlic; saute 1 minute. Set aside off heat; cool to room temperature, about 15 minutes. Add this mixture, Parmesan, scallions or parsley, and ½ teaspoon each salt and pepper to squash; stir to rough mash. Spread panko in a shallow dish. Scoop up of 1/6 of squash mixture and make a 4½-inch patty. Dredge 1 side in panko, pressing to adhere, and fit crumb side down into a cup in the tin; repeat to fill tin. Bake until squash is golden brown around edges, about 25 minutes, rotating tin halfway through baking. Remove tin from oven, break an egg into each cup, and sprinkle lightly with salt and pepper. Return to the oven and bake until the eggs are opaque around the edges and the centers are still loose and wobbly when you jiggle the pan, about 7 minutes. Cover the tin loosely with foil and rest for 3½ minutes for very runny yolks and up to 10 minutes for firmer yolks. Gently loosen and remove cups and serve at once.